Nestled in the municipality of Menfi, in Porto Palo, the ancient port of Selinunte, in one of Sicily’s most historic areas and immersed in landscapes of rare beauty, next to the natural reserve of the mouths of the river Belice, surrounded by dwarf palms, tamarisk trees, spiny rush bushes and yellow horned poppies. 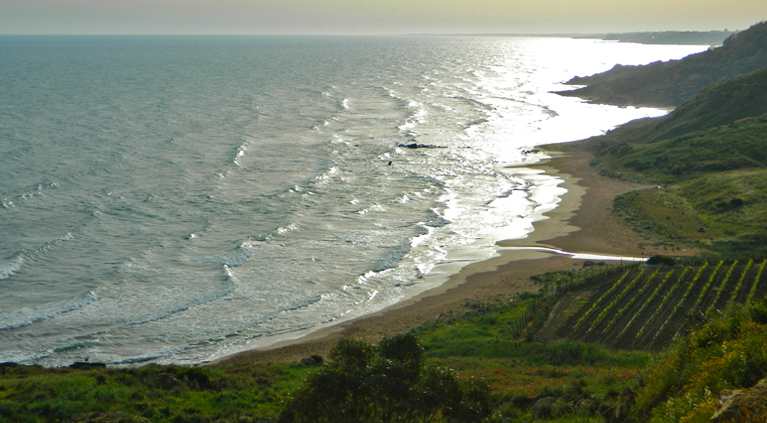 It is here, with vineyards stretching all the way to the beach that the Gurra di Mare estate set its roots, Castellare di Castellina’s newest company. A company that operates side by side with another Sicilian winery, the Feudi del Pisciotto estate. The palm is the symbol of the new company, a resource deeply rooted and extremely significant to the history and landscape of Sicily, yet today so fragile, subject to the recent attacks of the red palm weevil. With an eye to the future, part of the proceeds from the sale of Gurra di Mare wines go towards the research aimed at defining an action plan against this red pest. Gurra is the name of a small stream that flows into the sea and is one of the elements that best characterises the landscape of the Menfi municipality. Just under two hectares of Chardonnay and Viognier, on the terrains that descend all the way to the sea, in a unique micro-climate and surrounded by breathtaking scenery. 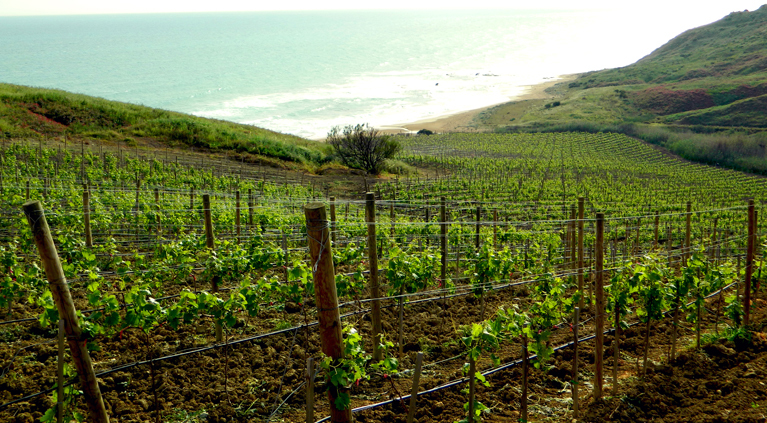 Taking care of a vineyard in a terroir such as this demands a precise and extremely meticulous care. But the results can offer great satisfaction. The only wine produced by Gurra di Mare is called Tirsat, which in Arabic means reef (it is no coincidence that the ancient name of Porto Palo was “Tirsat abi Tawr”). A name that pays homage to the character of a land that throughout the course of its history has served as a meeting point between different worlds and cultures. Tirsat is a blend of Chardonnay and Viognier grapes vinified based on the French “batonnage” technique (based on keeping the yeast cells in contact with the wine) to give life, in the lands made famous by the production of Planeta wines, to an elegant white with a fruity and very harmonious character. Gurra di Mare also produces an extraordinary extra virgin olive oil, thanks to the Nocellara del Belice olive variety and the strong influence of the sea, which enhances the flavour of the end product, allowing it to compete with the great Tuscan oils. Gurra di Mare wine and oil can be purchased directly from the Feudi del Pisciotto estate.